The Jupiter Delphi from IonWays is a 5-plate under counter water ionizer using mesh electrodes and up to 80 watts of power. With only 80 watts of power and some of the smallest plates of any major water ionizer brand on the market, we were curious about how well this model would perform. Honestly, we were surprised that the Delphi under counter water ionizer performed as well as it did in our tests. We had no problem getting the prized 9.5 pH level and respectable results at acidic levels as well. What we did notice with this model is a higher waste-water flow rate than we found with other water ionizers. On the upside, the Jupiter Delphi from IonWays did perform "as advertised" producing good levels of both alkaline and acidic ionized water. On the downside, if you're concerned about the amount of "waste-water" produced or live in an area where water conservation is a concern you should know that we saw more water "going down the drain" with this model than with other countertop models. Based on the level of waste water we saw we can only assume that this unit is able to produce comparable levels of alkaline and acidic water using fewer plates and less power because of the electrolysis chamber design. What you save by using less power you may lose by using more water. Still, the unit performed well in our tests. The Delphi looks nice with the controls and indicators nicely built into the faucet. It offers users 4 alkaline, 4 acidic and 1 neutral preset. One thing we didn't like about this model is the last setting default. With most other water ionizers, the unit will always default back to the last setting used that was considered safe for drinking. Whether you last produced acidic water or strong alkaline water, the next time you turn the unit on it will default back to an alkaline level suitable for drinking. This wasn't the case with the Delphi. If you dispensed acidic water the last time you used the unit, that's what it will give you the next time you use it. You'll want to pay attention to the audio and visual alerts each time you use the unit to make sure you're pouring yourself a glass of ionized alkaline water rather than acidic water. Granted, the audio and visual alerts do let you know the level of water you are producing however when you are distracted or in a hurry you may not notice them. That's exactly how we discovered the lack of any 'safe default' on this model. Someone here poured themselves a tall glass of acidic water and didn't notice it until they got their first taste. Like most water ionizers from IonWays, the Jupiter Delphi under counter uses a "double action reverse" cleaning system, reversing the polarity of the plates at each use rather than just during an automated cleaning cycle. The company is so confident in their "DARC" cleaning system that they do not offer any sort of cleaning cartridge. A bit of a let down for us - no matter what kind of automated cleaning cycle a water ionizer uses, there are still minerals in the water that are being attracted to one set of plates inside the unit. Cleaning cartridges use a citric acid (or citric acid based) crystals and no ionization to flush mineral scale buildup from inside the water ionizer. The citric acid element releases scale buildup while preventing minerals in the water from building up on the plates further during cleaning. Using the neutral setting while using the cartridge means that none of the electrodes are attracting more minerals during cleaning. An example of this is Chanson's Miracle MAX countertop model which uses the same type of automated cleaning technology which they call "shifting plates." Still the company recommends cleaning the unit once or twice a year using a solution made with citric acidic crystals. Should you ever experience performance problems with your Jupiter Delphi water ionizer, IonWays stands behind this product with a limited lifetime warranty. You are covered 100% for the first five years. After that IonWays will replace any parts necessary to restore the unit to proper working condition with the owner responsible for shipping and labor costs. Overall, the Delphi does seem to perform well. We like the advanced features available on other models a bit more - like the ability to customize presets based on your source water, a feature that was lacking on the Delphi. 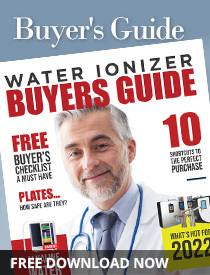 We think the price is a little high for a 5-plate water ionizer, even given the under-counter design. Still users should be satisfied with the quality of water produced in most source water areas. Warranty Limited Lifetime warranty covering parts and labor for the first five years then IonWays covers parts for as long as you own the unit.